Why does Britain flood more readily than the Netherlands ? In the news at the moment it seems a surprisingly large part of the UK is flooded. I've read of flooding around the Thames stretching all the way to Oxford, in Lincolnshire, the East Anglian Fens, in Cambridge near where we used to live and most of all in the Somerset levels. My family name, Hembrow, originates in Somerset. I lived there myself for many years of my life. It makes me especially sad to see that the Somerset levels have been flooded for six weeks already and that this has caused so much stress to so many people living in that area. Before we moved from Cambridge to Assen, a number of people warned us not to on the grounds that we'd be flooded "because the Netherlands is below sea-level". This wan't a concern to us at all. We had done our homework. What's more, because we were moving to Assen we were actually moving to somewhere which was at about the same altitude above sea level as Cambridge. Have we had floods in the Netherlands ? Here in the Netherlands, we get much the same weather as Britain. As such, we have had similar heavy rain and windy conditions in the last few weeks. However while we have seen reports of flooding somewhere in the UK every year since we left, there's been no flooding here at all in the last six years. While we lived comfortably above sea-level, the people who warned us about being "below sea-level" were right in one respect. A large part of the population of the Netherlands really does live on land which is below sea-level. The Dutch polders are a far larger area of reclaimed land than anything that exists in the UK. Much of it is significantly below sea level. The world's largest artificial island is Flevoland, also the newest province of the Netherlands. Flevoland is huge. It's considerably larger than Berkshire or Bedfordshire, nearly four times as large as the Isle of Wight. Almost this entire area is below sea level. If you fly into Lelystad airport then you land at an altitude of "-13 feet". People live in Flevoland, and indeed other low lying parts of the Netherlands, as much as 5 metres below sea level. With good water management, flooding is extremely rare. hours. This is not really flooding. I should make it clear that there have been reports of flooding and the media here plays it up somewhat. However, all they've actually had to report upon was heavy rainfall causing a few cm of water to stay for a few minutes or a couple of hours in obviously difficult places such as underpasses, or occasionally especially vulnerable cellars. Such problems are resolved very quickly. For instance, in one example last year I returned home two hours after my wife to find that her feet had got slightly wet as she cycled through a "flooded" underpass. When I'd cycled along the same route there was not even a puddle. This and related incidents nearby made it into the local press as "flooding". How to react to a crisis. In 1595, a man called Cornelius Vermuyden was born in a small village in the South of the Netherlands. Cornelius Vermuyden grew up become a land reclamation engineer and when he moved to the UK, he took his expertise with him. Mr Vermuyden was involved in draining Lincolnshire, the Fens of East Anglia and the Levels of Somerset. Britain has of course done more work on flood defences since the 17th century, but you won't be surprised to hear that it has been on a much smaller scale than in the Netherlands. Frankly, what the UK has done has not been nearly adequate. You can tell this because the UK still floods. Britain's current problems are due to not being able to cope with rainfall. However, the biggest flood disaster of recent history was due to a high tide and storm at sea which caused the North Sea Flood of 1953. This led to extensive flooding which affected both the East of England and the South-West of the Netherlands. While there is little to gain immediately from finger pointing in the UK right now, I think it's instructive to look at how two different nations responded to a previous disaster and consider how the UK should now respond to the problems which it faces. Just as with cycling, the difference between the UK and the Netherlands can be seen as a difference in Infrastructure. Both the Netherlands and the UK were affected by the devastating 1953 floods and both countries reacted. How well have these two countries protected themselves against similar future flooding events ? In response to the 1953 floods, the UK shored up much of the existing sea wall and built two large flood defences. The first was the Hull Tidal Barrier. This structure, spanning 30 m, is claimed to have "saved 19000 homes" in December. This barrier has closed about 12 times a year since it opened in 1980. 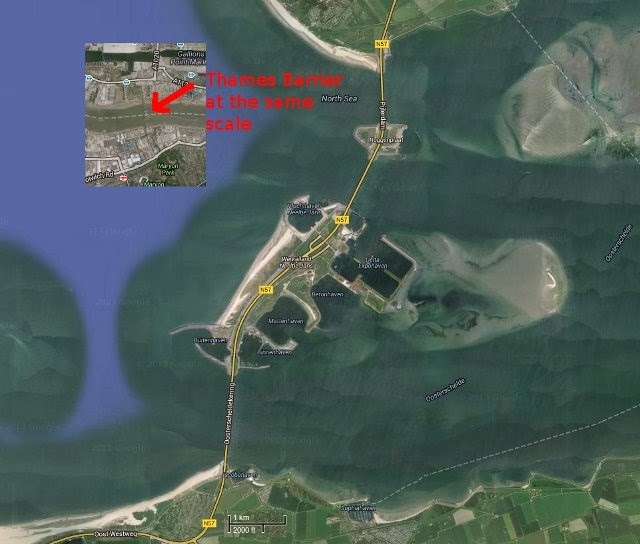 While the Maeslantkering could be seen as being on a overall similar scale to the Thames Barrier, this is not nearly the whole story. This is just one small link in a chain. In the aftermath of the 1953 floods, the Netherlands began something far more impressive than building barriers on this scale. The Maeslantkering is just one part of the last section of the Delta-Works, an extensive sea defence network which protects the whole of the South-West of the Netherlands. Work on the Delta-Works began almost immediately after the devastating 1953 floods and continued until they were declared finished in 1997. However, in reality, works continue now to ensure that the defences are proof against sea-level rise. To protect the North of the Netherlands there is another set of sea defences. The Zuiderzee Works. This again was built on an enormous scale, including the world's longest dyke. Also see the Lauwerzee works. Why is the Netherlands dry ? The Netherlands keeps both the countryside and the towns dry. Dutch people are not told by their politicians that there is a choice of town or country because it would be devastating for the country to lose either. A new law was created which commits the government to protecting the country from floods. While the pictures above all relate to flooding from the sea, note that the law applies equally to flooding due to rivers. The Netherlands has suffered this type of flooding in the past, but remedial measures taken against those are far in advance of what I've seen in the UK. The Netherlands doesn't flood because rather than making excuses as happens in the UK, the infrastructure has been built to protect this country. On holiday last year, Judy and I cycled for nearly 100 km kilometres next to this dyke, which protects farmland and small villages from the sea. Flood defences here are on a huge scale, ringing the coastline and around all rivers. The Netherlands doesn't flood because the Dutch decided not to let it flood. For many years we've been trying to encourage the UK to build infrastructure which is suitable to encourage the entire population to cycle. Again and again, cyclists are fobbed off with words which don't result in real change. Even aspirations for change remain extremely low. Britain makes a lot of noise, sends press releases around the world to try to pretend huge progress has been made, but this noise is completely out of proportion with what has been achieved. I see almost exact parallels with flood defences. The Thames Barrier is not actually nearly enough even to protect London and it does nothing for people who don't live near the Thames. What's more, it's on a microscopic scale when compared with Dutch flood defences. However, Britain has been making a lot of noise again. Search for "Thames Barrier" on Google and you get 1.3 M hits. "Maeslantkering" - just 66 K.
Britain: On the subjects both of cycling and of flood prevention, you need to stop pretending that marketing will fix the problems, stop shouting loudly about small "successes" and start watching how the Dutch build infrastructure ! ditch is dredged four times every year. The Netherlands has many thousands of kilometres of dyke and canal, much of which is used to some extent to fight against flooding and all of which is immaculately maintained. Water Boards are very important in the Netherlands. Everyones' safety depends on good water management. We vote for the water board in the local elections. The drainage ditches here are dredged four times a year which helps to make sure they work properly. Dredging has become a major topic in Somerset because abandonment of maintenance has quite possible contributed to the flooding, however the problems with Britain go a lot further than this. It's a systematic failure to have built the required infrastructure over decades which has made that country so vulnerable, not just that the dredgers haven't been used recently. That this basic maintenance has not been done is a symptom, not the disease. A few more links to Wikipedia may be of interest. Here's a list of all the sea-floods that have occurred in the Netherlands. A general article about Flood Control in the Netherlands is very interesting. 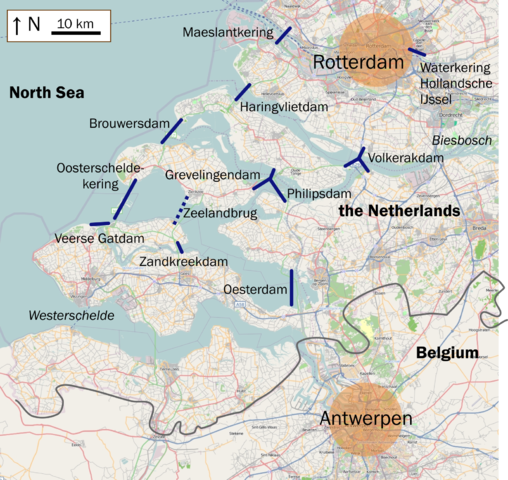 Note that because the Netherlands is the route to the sea for some of Europe's large rivers (e.g. the Rhine), this country has to deal with water which runs downhill from other countries, such as Germany. The Room for the River project is addressing conditions around some of these rivers in some cases allocating areas of controlled flood plain which will be allowed to flood. This has been misinterpreted by some British commentators as a wholesale retreat from flood defences when actually it's nothing of the sort. I also recommend that you read about river flooding and its prevention in the Netherlands. We now also know that in 2012, the present British government cut the budget for flood defences for the very areas in Britain which are now flooded. The flooding continues in Somerset. My mother sent me a copy of the local paper which is dominated by the continuing flooding problem. There are stories about fund raising for those who've lost their homes, estimates of how long until people will be able to return, how business are struggling to cope, how pumps brought in from a few km west of where we live in the Netherlands are now helping to move water a few km away from where my mother lives in Somerset. The newspaper also includes a letter to the editor from my mother pointing out that my father used to talk about how the flood defences were not maintained adequately. Sadly, he passed away five years ago so it's some time since he made those comments. This is not a new problem, it's the result of decades of underinvestment in the infrastructure required to keep Somerset safe from flooding. It has been surprise to me at all that many of the reactions to this blog post have been claims of exceptionalism such as that "Britain's coastline is longer". Of course it is true that Britain's coastline is longer. The UK is an island. However, that means there is more work to do, not less. Such responses are used to deflect criticism rather than responding directly to the argument. What I wrote above is a call for Britain to start taking action rather than making excuses. No two countries are the same. No two countries have the same challenges so no two countries have exactly the same solutions either. However, there's a big difference between doing things and not doing things. standard which prevents the Netherlands from flooding. Exceptionalism works in both directions. If it were the Dutch making excuses for flooding while Britain remained dry, Dutch people could point out ways in which the UK is different to the Netherlands and which make the task of staying dry so much easier for Britain. e.g. a far smaller proportion of Britain is at or below sea level than is true of the Netherlands so Britain has to protect a smaller proportion of itself from the sea. Also, all of Britain's rivers start and end in the same country so the flow of water is entirely under British control, while the Netherlands has to deal with water which has run from the Alps and picked up volume all the way through Germany when there are heavy storms, so it is German flooding that affects the Netherlands. But these are both hypothetical responses to a situation which does not exist. It is Britain which floods and the Netherlands which remains dry. Why ? That was the entire point of this blog post. The point remains the same. The Dutch do engineering and solve problems while Britain makes excuses and is affected by problems which could be resolved. This was not always the case. As I've pointed out elsewhere, Britain made remarkably fast progress on things like the motorway network in the 1950s, which were then considered to be important enough to attract investment. In September 2014 the same machine came back again to dredge the same ditch for the third time this year. Maintenance is remarkably regular and comprehensive, four times a year in this case. Not only dredging happens on a regular basis, but also all the other things that Britain puts off as well. This is why Britain floods but the Netherlands does not. It comes down to actually doing the work: Having a policy and following it consistently for decades. In other news, the Netherlands has also just announced that there is to be €20 Billion invested in a new Deltaworks. This is to prevent the chance that the existing extensive sea dykes will prove inadequate. 1500 km of the existing 3700 km of dyke are to be upgraded at a cost of between €7M and €9M per kilometre. 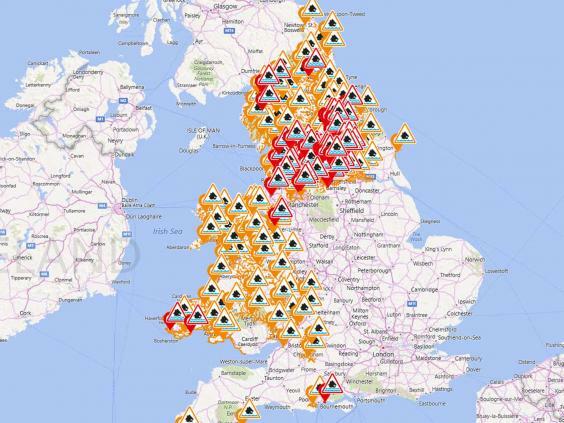 Britain has "widespread flooding" once again. The map on the right shows the 190 flood warnings in force across the UK over the Christmas holiday. Those which are red involve risk to life. Of course, this didn't come about with no warning at all. Some "defences" broke down for the fourth time in a month during these particular floods. Some homes were flooded for the third time in one month. Even the language being used is a bit ludicrous. If a flood "defence" isn't adequate to stop the water, then it is not really a defence against flooding. Britain is simply still not investing anything like enough in flood defences. Though it seems that there is now some consideration that a "rethink" might be required, the emphasis seems to be on such things as "solid floors, waterproof plaster, more electrics up the wall - so that people can get into their houses and businesses more quickly", which are not quite the same thing as preventing flooding from happening in the first place. Meanwhile, here in the Netherlands - the country which many British people imagine is more vulnerable to flooding than their own - we've had no flooding at all. Sadly, the UK has just voted to leave the EU. This will have a devastating effect on the British economy and a devastating effect on the British people. Though this happened just four days ago, it has already had a terrible effect on my family and myself. But what does brexit have to do with flooding, you might ask ? Unfortunately, the brexit was preceded by many years of the British press telling outright lies about the European Union. Not just a few false stories, but hundreds of them, which you can find listed here. Amongst them is a suggestion that the EU is somehow responsible for floods in the UK. This is of course utter nonsense. The EU actually provided help to flooded communities and funding for flood defences in the UK. But the UK is now leaving the EU, so in the future you can forget about that source of funding for flood defences.